Abs Diet - Diet Reviews: Does Abs Diet Really Work? The Abs Diet is an incredibly popular weight loss and wellness guide, as this program focuses on the foundational steps of healthy eating and exercise. By adhering to the Abs Diet tips and suggestions, dieters should be able to enjoy increased muscle mass and decreased body fat. What is the Abs Diet? According to the creators of the Abs Diet, muscle in the body has the natural ability to burn more calories. Specifically, just one pound of muscle can burn an extra 50 calories each day! With this fact, individuals who are able to build up even just 10 pounds of muscle in their bodies are able to burn an extra 500 calories daily. As there are 3,500 calories in every pound of body fat, training your body to burn an extra 500 calories each day will result in a full pound of fat loss each week. 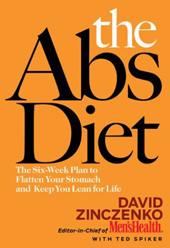 To help dieters become more powerful fat-burning machines, the Abs Diet teaches individuals core principals of health and wellness. Specifically, the Abs Diet teaches about healthy eating, nutrition, and exercise.